I can not believe in the veracity of these pictures! Wonderful insight into old Japan. Thank you. Tokyo’s Shintomiza Theater (新富座) was managed by the legendary Morita Kanya (守田勘弥, 1846-1897), who introduced direct ticket sales—which used to be monopolized by theater teahouses—, bright lights and evening performances to the Japanese theater. His experiments and modernizations in both method and content made the Shintomiza Tokyo’s premier theater. When former US president Ulysses S. Grant (1822-1885) was invited to watch kabuki during his 1879 (Meiji 12) stay in Japan, it was this theater that he visited. For this special occasion, lacquered chairs and carpets were brought in from a nearby palace. Just to show how important his visit was, the Prime Minister and three royal princes also attended. Quite unique in itself as kabuki had long been considered vulgar and for townsfolk; people of samurai class would have carefully disguised a visit. Kabuki had actually been banned to Asakusa, on the outskirts of old Edo, during the last spasms of Tokugawa rule. When the Meiji Period began and old laws and customs were thrown by the wayside, the ambitious Kanya had been the first theater owner to move back into the center of the city. In 1872 (Meiji 5), he selected Shintomi. Originally the site of samurai mansions like the Honda residence (Omi Zeze Han, 近江膳所藩本多家), the Shin-Shimabara red light district had been established here upon the start of the Meiji Period. This however failed and was closed in 1871 (Meiji 4). Either through smarts, or sheer luck, Kanya made an excellent choice. Shintomi was located just east of Ginza, the area that was about to become Tokyo’s most fashionable district. 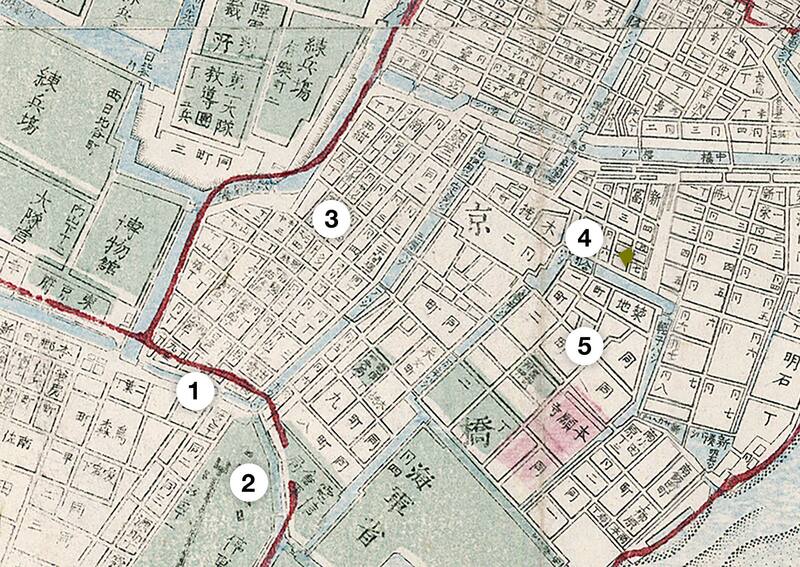 The area was also right next to Tsukiji, where the foreign settlement was located. 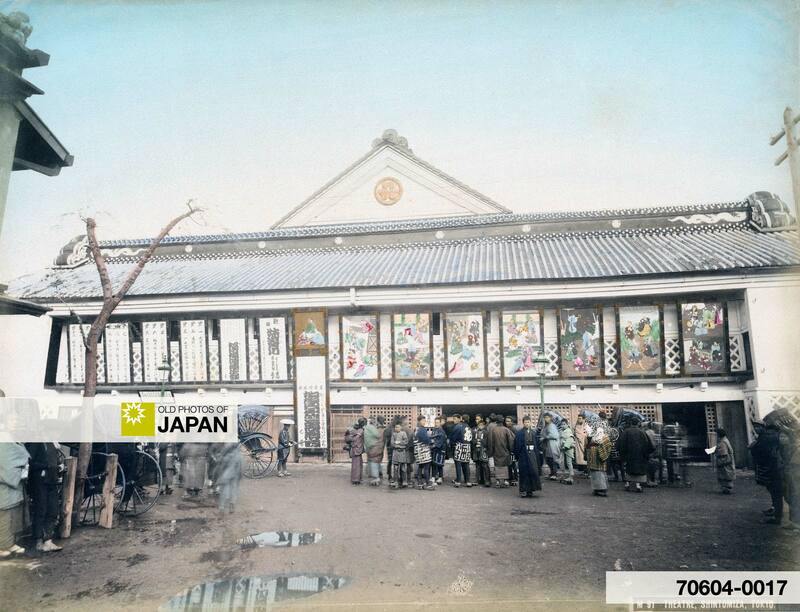 In 1875 (Meiji 8)1, Kanya renamed his theater from Moritaza to Shintomiza. By all accounts, Grant loved the performance and considered it a highlight of his visit to Japan. He must have especially appreciated the dance that was performed for him. More than 70 Yanagibashi geisha2 danced in kimono of horizontal red and white stripes and blue juban (underwear) with white stars, using fans decorated with the Japanese and US flag. The musicians meanwhile were dashed out in blue clothes with white stars, or clothes with red and white stripes. It must have been an incredible sight. A woodblock print showing the interior of the Shintomiza in 1878 (Meiji 11). The first Shintomiza burnt down in 1876 (Meiji 9) when a large fire ravaged through the Kyobashi district. The theater was re-opened on June 7, 1878 (Meiji 11)—just in time for General Grant’s visit the following year—with many of the foreign nationals who lived in Tokyo attending the ceremony. The new theater featured chairs and gas lamps and was considered to be extremely modern. Although to us it now looks deliciously traditional. In spite of this setback, the Shintomiza remained extremely popular and for a while even managed to compete with the new Kabukiza, opened in 1889 (Meiji 22). Although some experimentations—like foreign actors—didn’t catch on, Kanya’s modernizations were very important. They made the Shintomiza one of the symbols of Japan’s Westernization movement during the Meiji Period (文明開化), and laid the foundation for kabuki as we know it today. At the height of Shintomiza’s popularity it was surrounded by some 41 teahouses, restaurants, other theaters, as well as the houses of actors, musicians, playwrights and everybody else connected with the theater. Kanya had literally transformed Shintomi from a deserted area into a bustling theater district. In 1909 (Meiji 42), the Shintomiza was bought up by Osaka’s Shochiku company, which also became the owner of the Kabukiza in 1912 (Meiji 45). Shintomiza’s tragic end came on September 1, 1923 (Taisho 12), when the Great Kanto Earthquake destroyed the theater. It was never rebuilt and only an unimpressive plaque reminds of the spot’s illustrious history. On the theater’s location now stands the Kyobashi Tax Office.5 Laughter has undoubtedly vanished from the place. This detail shows the signs, as well as the large variety of customers. 1892 (Meiji 25) Map of Tokyo: 1. Shinbashi Bridge; 2. Shinbashi Station; 3. Ginza; 4. Tsukiji Foreign Settlement. 1 新富座子供歌舞伎, 新富座のいわれ. Retrieved on 2009-05-21. 2 This is what a wide variety of sources say. The actual English program for the performance contains the following text: PANTOMIME AND BALLET. Several Views are Given, Illustrating Scenes in Ginza and Incidents of the Arrival and Reception of General Grant. Fifty Actors Engage in a Festival Dance. 4 National Diet Library, Theatrical Performances and Theaters in the Meiji Period. Retrieved on 2009-05-21. 5 京橋税務署: 2-6-1 Shintomi, Chuo-ku, Tokyo. 6 National Diet Library, Theatrical Performances and Theaters in the Meiji Period. Retrieved on 2009-05-21. You can also licence this image online: 70604-0017 @ MeijiShowa.com. @fotografia ślubna warszawa: Your comment can be interpreted as an exclamation of excitement, or a statement of disbelief. I think you meant the former. But just in case, some additional sources about these old photographs of Japan. To see other examples visit Nagasaki University Library Collection or the Massachusetts Institute of Technology. Both of them are extremely reliable sources, as is Old Photos of Japan. As you have certainly noticed, I research the photographs in my collection very carefully.